Super Stardust HD launched on PS3 in 2007. Now, ten years later, Housemarque ups the ante. It was ten years ago that a game called Super Stardust HD saw the light of day on PlayStation 3. As a Finnish developer with roots in arcade gaming, we at Housemarque got to create a game that combined lighting fast reflexes with a myriad of colorful explosions. SSHD combined a thematic setting similar to the classic Asteroids blended with the twin-stick control scheme of Robotron. 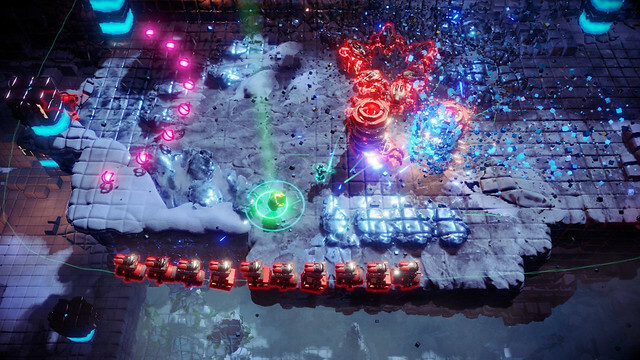 Now, after a decade of learning more and more about how to perfect the formula, we are proud to finally release Nex Machina, the culmination of our search for pure arcade gameplay. A game where simplistic design (only two buttons and two sticks are ever needed) allows players to immerse themselves in such a way that we’re calling this feeling “The Zone”. Getting into the zone allows for extremely complex movement patterns and tactics to arise and players who wish to compete on the worldwide leaderboards can create truly unique personal playstyles. With Super Stardust we wanted to keep the arcade torch shining bright and now we want to do that again. Our hope is to capture a bit of that spark that lived in arcades when videogames were held back by graphical and technological constraints. Being able to do that with Eugene Jarvis, who inspired us when we started gaming, is beyond wonderful. 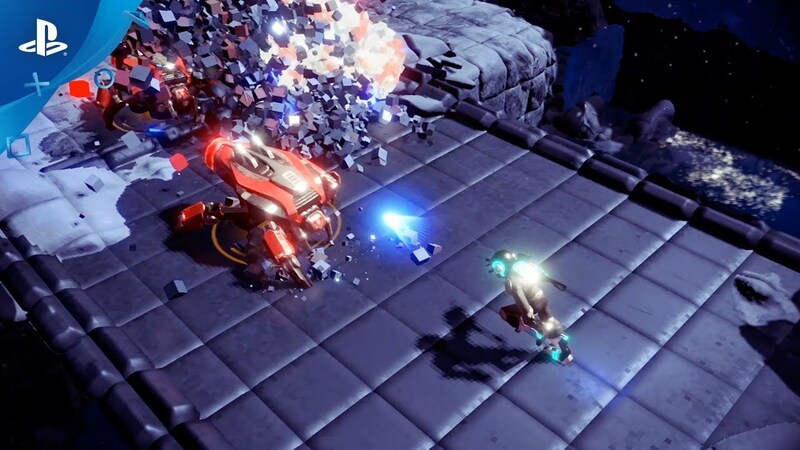 So take on the arcade challenge with Nex Machina. Compete against your friends and the rest of the world on the global leaderboards. Now available for $19.99 USD ($26.99 CAD) at PlayStation Store. Guys, guys, guys! Holy mother mackerel! I rarely preorder games nowadays but im so glad I did and got to start playing the second midnight struck! Another Housemarque classic and probably my favorite thus far! Cannot believe or should I say CAN believe and so, so HAPPY! Congrats to the team and special shout outs to Eugene Jarvis whom helped put this beauty together. You know, until a year ago when i visited a game bar here in Orlando, Fl i never seen nor played Robotron and im 39 years old, sorry about that. But that changed that night and then I knew what the hype was about. #So Great To Be A Gamer Right Now! BTW, any chance on an Alienation discount in the near future? Congrats to shipping this awesome game! Big HMQ fan here and I can’t wait for Matterfall in just a few months as well! I will always buy anything from Housemarque without question. They understand my gaming needs and deliver every time. The game’s cheaper on Steam right now. Stayed up to play the first world. So far it’s great. 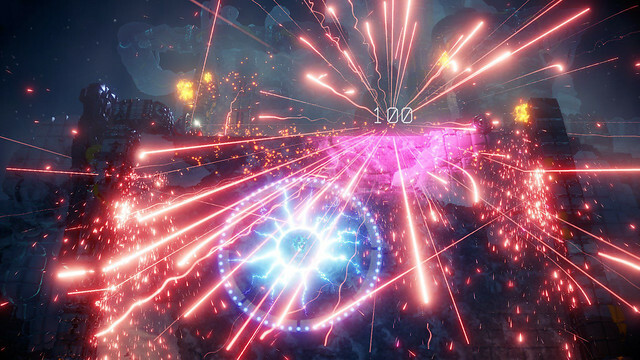 All the spectacle and fun of Super Stardust HD or Resogun but in a twin-stick shooter. Can’t wait for work to be over so I can dive back in. Thanks for having local co-op at launch. Haven’t had this much fun with an arcade shooter type game since Resogun. First ever digital game that I have ever pre-ordered. Played it for a few hours this morning, and it delivers. Great game Housemarque and Eugene Jarvis! Played a few more games this afternoon. The difficulty level on this seems MUCH higher than Stardust or Resogun. That’s neither a good or bad thing IMO. This game is much more difficult than the beta my lord! Is the discount for pre-orders only? Congratulations Housemarque for yet another boss game…you guys are the best. as a PC & PS4 player (PC being my main platform) i just wanted to take a second to thank the team at House Marque for ALWAYS delivering a top-notch quality product and ESPECIALLY for throwing your efforts behind releasing this game on Steam! i know i speak for MANY a PC player when i say ‘PLEASE BRING MORE OF YOUR FANTASTIC GAMES TO PC! !” lol I’d also like to humble brag about finally getting through Veteran mode and looking forward to Master! everyone at House Marque should be very proud to add Nex Machina to their already STELLAR catalog of games! This game is truly excellent! Much like several of Housemarque’s previous shoot-em-up games, this will be a fixture in PlayStation gamers’ libraries for years to come. Congratulations to the development team on another job well done. Looks great, does this have Stereoscopic 3D like Super Stardust has? If yes, I will go ahead and buy it now. If not I will wait for a patch or a price drop, thanks! I loved it while it lasted. Was rather short for the asking price. Not much to do after its over…!